One of his paintings, “Harlequin’s Carnival," looks like a carnival with its bright blues and orange and yellow. There are squiggles, strange animals and a fish lying on a table. However, Miró’s paintings show movement, and each section tells a little story. You could spend a great deal of time looking at and getting involved with these compelling pictures. Art for most people means becoming emotionally intrigued or trying to relate to how a painting makes you feel. Miró, who lived from 1893 to 1983, had work that lives through the ages and still today, creates feelings in art. His friend Desmond Morris was also a surrealist artist, but he worked as a zookeeper during the day. When Miró visited the zoo once, Morris asked him what he would like to see. Joan said he wanted to see large birds, snakes and strange creatures of the night. Miró especially liked the chameleon that had swivel eyes that could look in different directions at the same time. Author Antony Penrose knew Joan Miró and once said, “Surrealists make pictures of dreams… Joan Miró painted things from his imagination." Miró was born in Barcelona, Spain, but lived outside in the countryside in a place near Tarragona called Montroig, which means “Red Mountain." His father did not want him to become an artist, but Joan later retaliated by saying his father was not a fine goldsmith but a man who repaired watches. Joan’s father tried to get his son interested in being a clerk in a business office and a kind of breakdown of spirit occurred because of it. Maybe that is why men don’t show up in Joan’s paintings but women do. The area of the Spain of his childhood was also a region known as Catalonia and very distinct and different from the rest of Spain. The Catalans had their own language, religion, heroes, dance and culture that were very precious to them, especially when the dictator Franco tried to take these away from them. For that reason, they were quite patriotic, as was Joan. However, the farm Joan grew up on fostered his dreams. It is where he got into nature. He once said, “The smallest thing in nature is an entire world." He also liked to put anchors, starfish and shells into his paintings, along with mushroom heads of preposterous size and shapes of gourds called calabash. Joan sought out poets and poetry. Soon words and parts of words showed up in his paintings. One of his favorite things to do was to visit a park on the outskirts of the city of Barcelona where an artist named Gaudi decorated curving benches covered in broken ceramics—plates, bits of teapots, bathroom tiles, anything like that. The workers that helped him invented patterns mosaic style; Joan loved it there. Joan also haunted the museum of Catalan as a child. It sat high above the town on Montjuic—the museum was full of Roman-style frescoes taken from small churches—popular around the 12th century. He started by visiting at eight years old and attended it all his life. He remembered best the “Angels of the Apocalypse." When he became a man about town, Joan always wore business suits and ties, pointed dress shoes, and a smile. No one would suspect he had a magic vision. The other thing he was good at was watching. He studied animals and settings, collecting images to use in his work. Joan Miró worked in a variety of media from painting and printmaking to sculpture and ceramics, often achieving surprising and disparate results. He moved from Spain to Paris in 1919 and was exposed to many different forms of contemporary art that changed his concepts. He was swept away by painter Vincent van Gogh. Then his admiration turned to Cézanne. The avant-garde work Cubism also entranced him but it was the French Impressionists that he said, “…was almost a religious experience." So overcome by Impressionist art that one time he kissed a landscape by Monet when the guard wasn’t looking! He also became friends with Picasso, another artist from Spain. He was a friend to Picasso’s mother too, even carrying a cake from Spain to Paris to give her son. Picasso often asked to see Joan’s work and, as a result, bought Miró’s “Self-Portrait" and the 1921 painting, “Portrait of a Spanish Dancer." In his early years of painting, 1921, Miró worked on a huge canvas of farm life. He had said that nobody liked it; it was a very big picture, hard to sell. He didn’t have any money then and had to use a taxi to transport it to dealers. Then Ernest Hemingway bought it and they became good friends. Eventually, Miró took boxing lessons and they would spar at the gym. Hemingway and Picasso supported his art. Even though many other painters influenced him, you could not pin down his style of work. It was unique. As he got older, his canvases became spare. One is called, “This Is the Color of My Dreams." 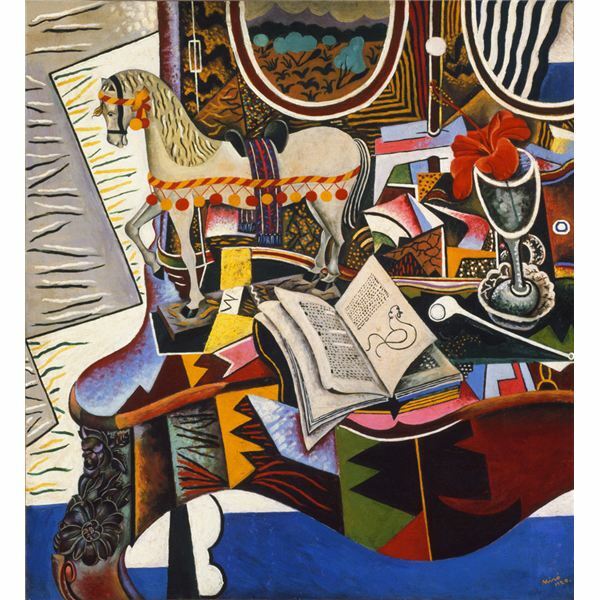 Based on a photograph he liked, the work actually used the word Photo in careful painter script, and beneath is a small blue cloud and under that Miró wrote, “This is the color of my dreams." Max Ernst, another influential painter, sculptor and poet, owned it. Miró had some quirks: he was almost fanatically neat. He could become depressed in mood too, and while not concerned with actual politics, sometimes his work made statements such as during the Spanish Civil War, where he made a broadsheet called “Aidez l’Espagne" showing a Catalan peasant with a gigantic clenched-fist. Joan Miró would hole up for months at a time in Gallifa, a mountain village with no electricity or telephone and work on small sculptures, pots and plaques. He did such varied things there as: creating the basis for “The Wall of the Sun" for the UNESCO headquarters in Paris, made costumes for Catalan actor-mimes who would perform the Claca, and completed a marble and glass mosaic wall for Wichita State University. Penrose, Antony. Miró’s Magic Animals. New York: Thames & Hudson, 2016. Book. Bernier, Rosamond. Matisse, Picasso and Miró As I Knew Them. New York: Alfred A Knopf, Inc., 1991. Book.